Successful cases of shelling sunflower seeds. 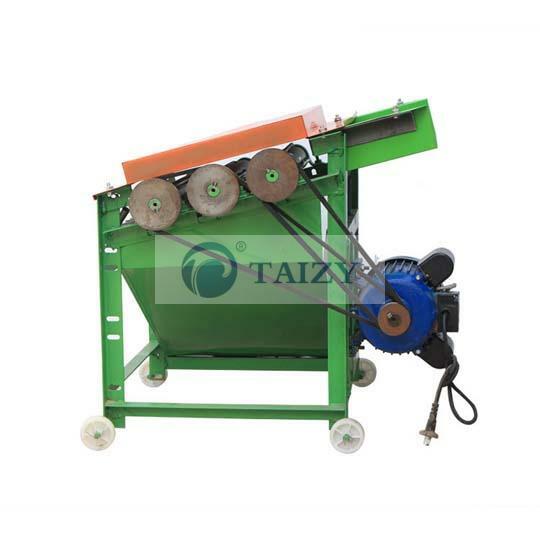 Our factory has three kinds of shelling sunflower seeds machine, and TZ-200 is the smallest model. 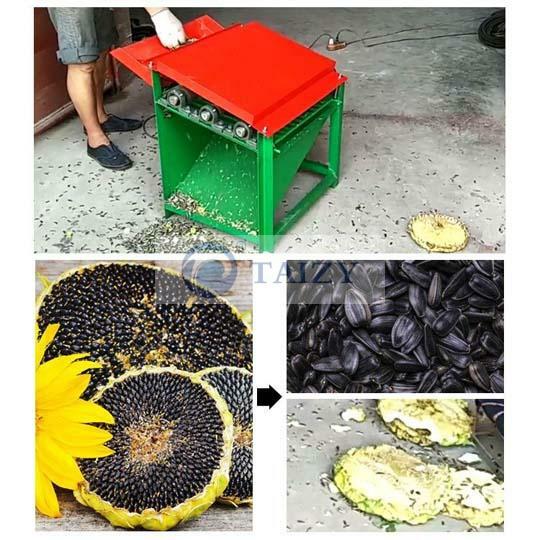 TZ-200 sunflower shelling machine bears the advantages of small size and cheap price and is easily operated by one person. Most importantly, there is no harm to seeds themselves, meeting the requirement of small farms. 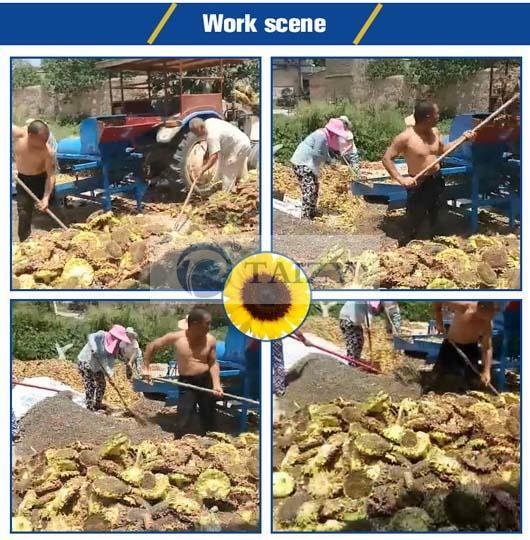 If you have a big sunflower farm, it is better to choose higher capacity thresher, that is, 1500-2000kg/h, greatly reducing labor intensity and improving labor efficiency. We choose 2.2kw motor for this small model homemade sunflower seed sheller. Please pay attention to the engine power, if the power is more than 2.2kw, the seeds will be broken, increasing the broken rate. 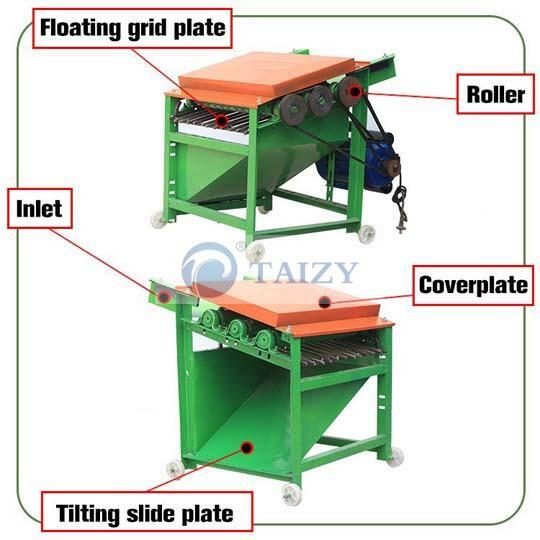 This small size sunflower seed shelling machine mainly consists of floating grid plate, roller, cover plate, inlet and tilting slide plate. When sunflowers go into the threshing part, influenced by the friction of three rollers, the seeds and sunflower plate are separated. 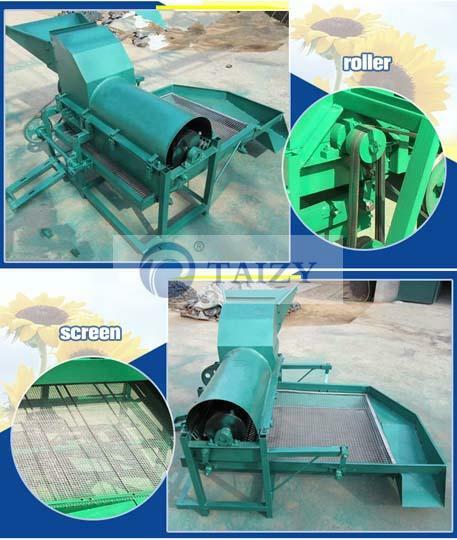 Sunflower plate is blown out horizontally, while seeds will be collected by the bottom of the machine. Small size. The machine is small in size and light in weight(45kg), and is easy to move, fitting for home use. 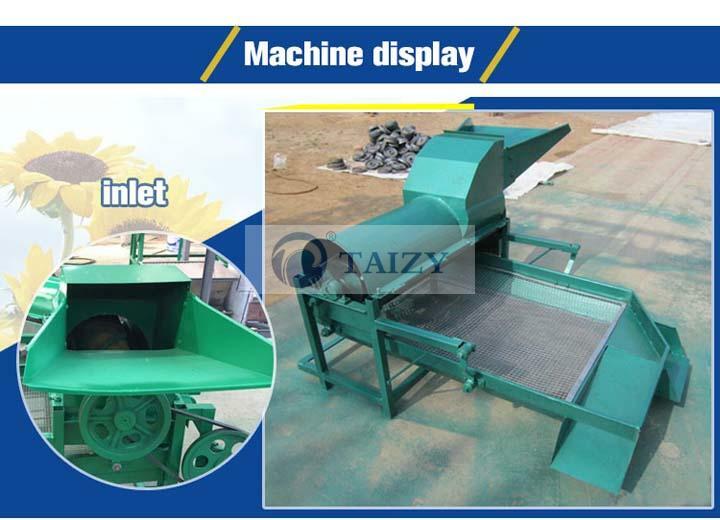 Only one sunflower can be placed into the inlet, which makes sure machine thoroughly threshes sunflower, increasing threshing rate. Please kindly add lubricant oil regularly to ensure sunflower seed sheller machine to work well. 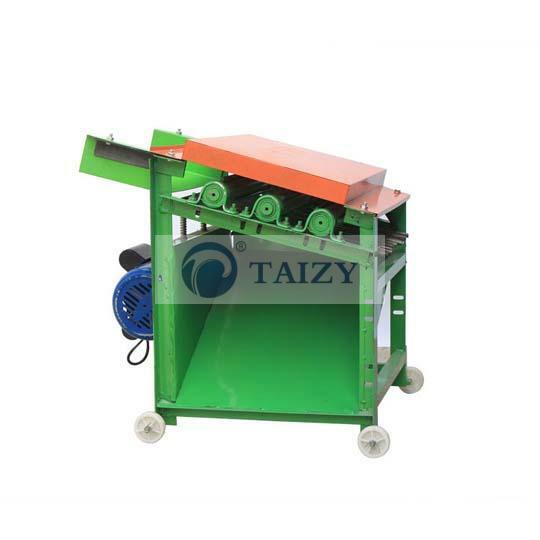 Middle-size sunflower thresher is equipped with high quality, and it can match with 4kw motor, diesel engine or gasoline engine. 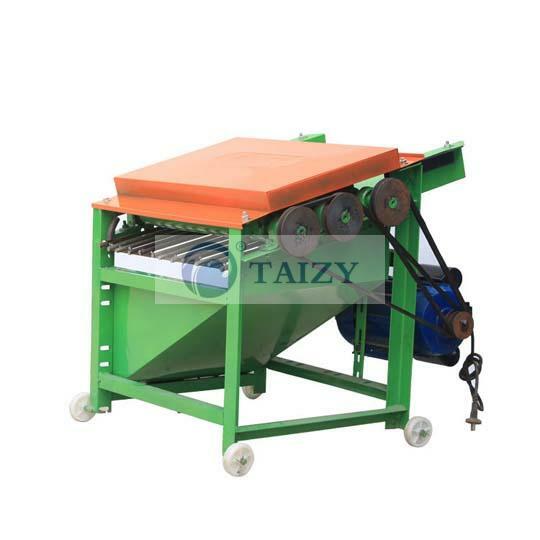 Sunflower seed sheller machine connects with the small four-wheel rear wheel and is a new design thresher machine that is suitable for sunflower seed, saving much labor time. 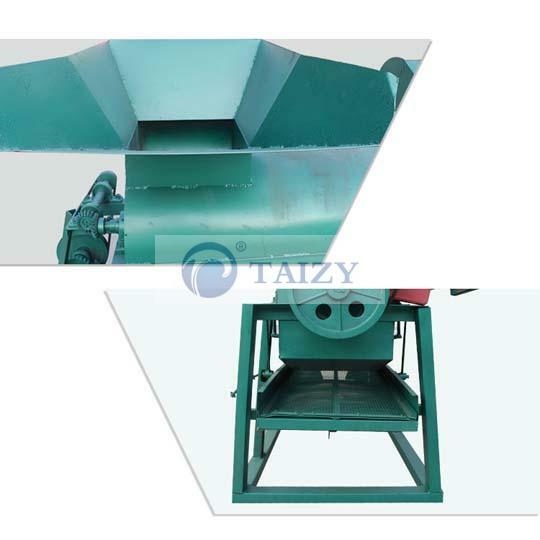 Sunflower seed shelling machine has many advantages such as advanced structure, convenient use, and high removal rate. All kernels will not be broken and can be operated for a long time with capacity 800-1000kg/h. 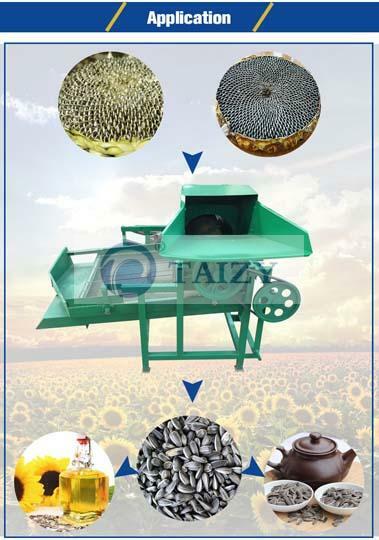 The sunflower threshing machine is made of threshing roller, sieve, holder and suspension frame. The machine includes a tubular working chamber with a feeding port on the upper side and a discharge port on the lower side. 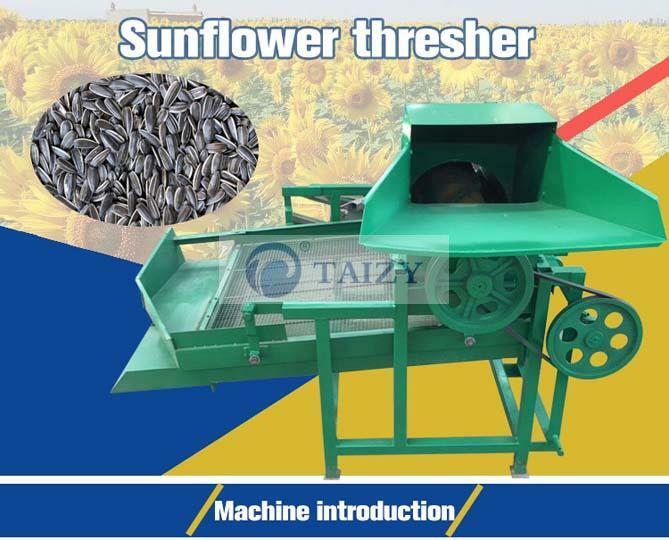 The oil sunflower threshing machine is a machine which challenges the traditional hand threshing method and especially used for threshing oil sunflower seeds. It has advantages such as reasonable structure, high threshing rate, no broken seeds, high speed, complete separation, convenient operation, high working efficiency, and good threshing effect. It is ideal equipment for oil sunflower industry, fitting for long hours work. Firstly, fix the main unit installation. Then adjust the triangular tape to be tight. Machine idles for a few minutes to observe whether there is noise or stuck phenomenon. 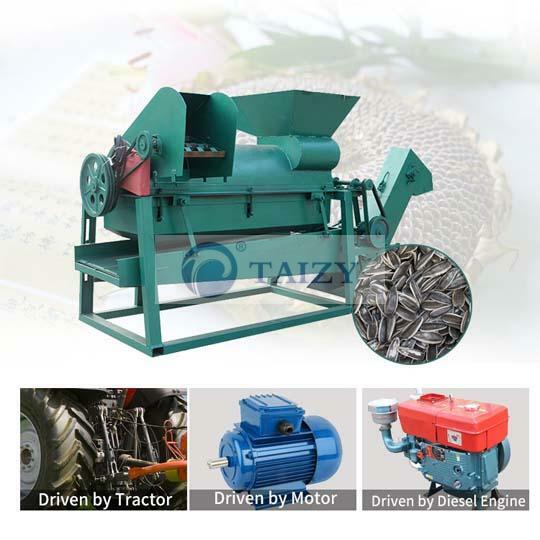 If the sunflower threshing machine works abnormally, stop and check it immediately. Workers put the sunflowers into the inlet. Sunflowers are squeezed and kneaded through the rolling axis and floating grid bar plate. After that, the sunflower seeds can be removed from the plate. 4. The falling sunflower seeds pass through the gaps at the floating-board and slide down from the outlet. 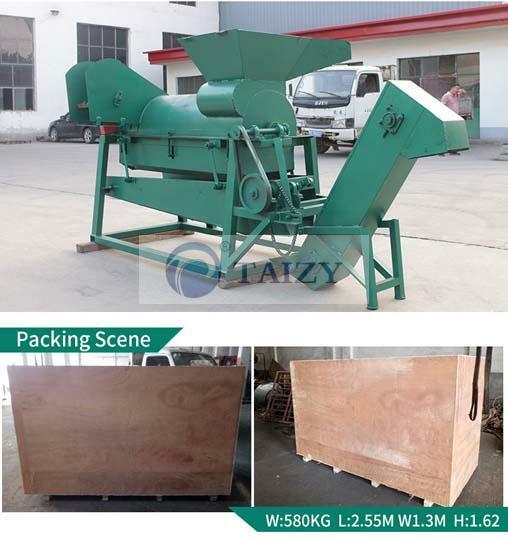 In 2018, 20GP big-size sunflower thresher machines are delivered to Tanzania, and we have cooperated with this customer for many times. To ensure the quality of the machine, he visited our factory during the production and talked about the details that needed to be paid attention to. Therefore, we attached great importance to what he emphasized so as to make him satisfied. We also took him around the famous scenic spot after long time negotiation. Being attractive to the local snack and beautiful scenery, he said that he would come to China again and again if possible. At the beginning of March 2019, we sold 10 sets shelling sunflower seeds machine to Kenya, and this customer was just a farmer and wanted to buy those machines for his neighbors and him. They planted a lot of sunflowers, thus, this machine was important for them. Our sales manager solved all his problems with great patience, that is why he ordered 10 sets just within 3 days since he got our contact detail. What is the capacity of 3 types shelling sunflower seeds? Its capacity is 100-200kg/h. 800-1000kg/h, 1500-2000kg/h respectively. What is the loss rate of sunflower seeds? The loss rate of 3 types thresher is less than 2%. What is the difference among 3 types shelling sunflower seeds? 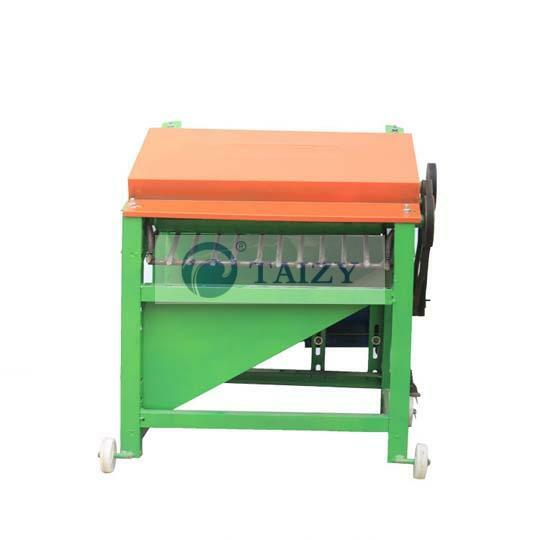 The small size thresher is suitable for home use and its structure is simple. The middle-size one has a vibrating screen on the base of the first one. 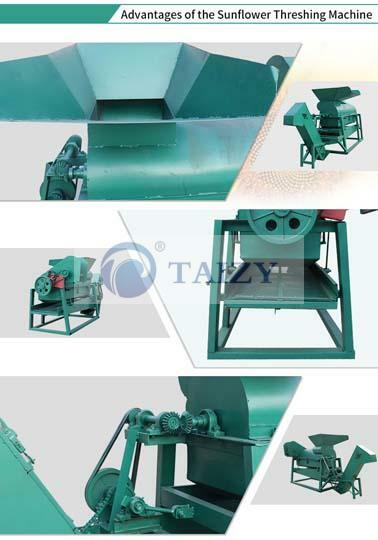 The big size sunflower threshing machine bears more complicated structure and higher capacity. 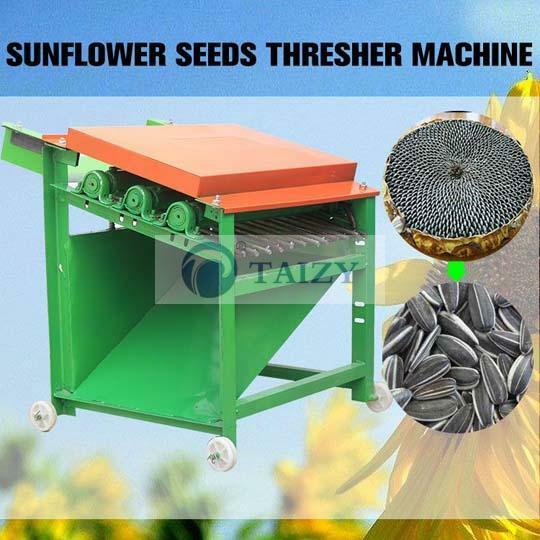 As for small size thresher, can user only place one sunflower one time? Yes, users usually put one into the inlet but also can place two sunflowers if its size is rather small.